This month has been mellow and nostalgic as it’s often in October in Umbria. While still reeling after a summer of record-high temperatures, we have enjoyed a string of magnificent sunny days and Technicolor sunsets. It’s been like a balm for body and soul. We miss our own olive harvest. The extreme temperatures and drought have damaged the fruits. Sadly, for the 4th year in a row we have had no olives to pick. However, our friends – who have fields at lower altitudes- have managed to save their crop and we can enjoy the fragrant aroma of new oil. After such a rough season, it feels like a miracle. Even if we don’t have oil, I am happy to support my friends who work so hard to preserve our traditions. If you need fresh olive oil from here, hurry up to order from Corinna at San Potente, it will sell out very fast. separating olives and leaves at San Potente Olive Farm, by evenings the olives will be turned into emerald green, fabulous oil. The highlight of this month is our yearly Olive Harvest Tour. We have a group of delightful guests who have savored not only the new oil, fabulous wine and all sorts of seasonal foods but also plenty local experiences, good company and laughter. I am so lucky to work with our guardian angel Heather at Smitten Italy and Barbara, fairy of logistics at Wine Link Italy to make all this a truly special experience! As for myself, I have developed an obsession with green noodles recently. Together with pumpkin, my favorite fall vegetable, they have been the star of several cooking classes. Helen, one of our tour guests, has defined her plate ” a bowl full of heaven”. I hope you will enjoy it as much. Steam or boil the spinach, drain and make sure to remove all excess moisture from the leaves by squeezing really hard in your hands. In a food processor blend the flour and spinach at high speed until you have a light green powder. Add the egg, salt and olive oil and incorporate completely. Start adding the water until the dough forms a firm ball. Remove from food processor and allow the dough to rest for at least 20 min on a floured cutting board. Cover the dough with a cotton towel if you think it might dry too fast. 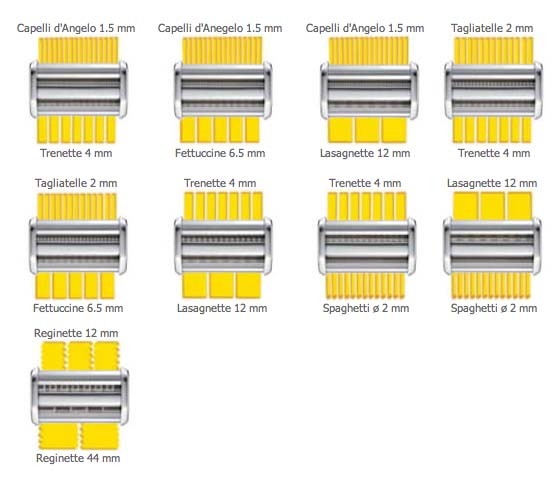 Set the smooth rollers of your pasta machine on a wide setting. I use one down from widest. Cut the dough into 4 or 5 pieces. Flatten one piece of dough into a rectangle and feed through the rollers. Fold the rectangle in half and feed through the rollers 3 or 4 more times to obtain a 10-12 cm (4-5 inch) long sheet. Dust the dough with flour as necessary to prevent sticking. Roll out each piece of dough in the same manner. Cut the dough into narrow ribbons while the pasta is still soft. I use a trenette cutter. Stringozzi should be narrow and have a round or square-ish section measuring about 4 mm (1/6 inch). If you don’t own a trenette/linguine cutter, use a sharp knife or a medium fettuccine cutter, then roll each ribbon in a round shape to make irregular thick spaghetti. If the weather is damp, you will need to keep flouring the pasta to avoid sticking. Clean and slice the pumpkin or squash, transfer into a roasting tin, add quartered onions, 2 tablespoon olive oil and sage. Roast at 200 °C (390°F) until soft and falling apart. Remove the sage, add 1/4 teaspoon salt, stir and transfer into the bowl of a food processor. Process until thick and creamy. Transfer into a bowl and keep warm. Blend or chop parsley and garlic with a tablespoon of olive oil to a paste. Transfer in a saucepan which must be large enough to hold the pasta once cooked. Add ricotta, heat it briefly and switch off the heat. Cook the pasta following my basic instructions, using a tall stockpot with plenty salted water as explained here. Have everything ready before starting to cook the pasta. Stringozzi cook in one minute. Also, they overcook easily, after 2 min they will be ruined! Warm up the pumpkin if it has become cold. Diluite with warm milk if it is too thick. While the pasta is cooking, ladle the puree pumpkin into the plates. As soon as the pasta water returns to boil, the noodles are cooked. Drain and transfer into the pan with the parsley, garlic and ricotta. Add a ladleful of pasta water and stir. Add grated cheese and stir again, adding more pasta water if necessary to keep the mixture moist and glossy. Transfer atop the creamy pumpkin puree and serve immediately. If you are pressed for time, you can use regular white stringozzi or even store-bought penne. Stir the cooked pasta with the roasted squash, parsley, garlic, grated cheese and ricotta all at once. You can also use farro or spelt instead of pasta and use fennel fronds instead of parsley (no basil!). Whichever way, I recommend a glass of red wine, a bit of music and your favorite company or a book by the fireplace, it will be lovely. How beautiful! Here at home, pumpkin is only thought of with spice and very sweet. It is so much more than that! This looks awesome and will be on our table soon! Ciao Leti! ciao Jeff, this recipe is good with every good squash or pumpkin as long as it’s not the watery, tastless type, enjoy! I will have to get over my fear of making fresh pasta. I have the attachment for my Kitchenaid so I need to get on with it! Wish me luck. Perfect recipe to try. That tour guest and the word YUM sums it up succintly. Gorgeous! These look absolutely gorgeous, in both the visual and gustatory senses. And I must say, those views of the Umbrian hills are breath-taking. It must never get old! thank you Frank, I hope you will get to see our little corner of paradise one day!